The Client: TLA - Bale Tech, LLC a subsidiary of Transload America, Inc.
TLA - Bale Tech, LLC is a subsidiary of Transload America, Inc. TransLoad was formed in 2002 to own and operate businesses associated with rail-based transportation, handling, recycling and disposal of waste material. The Company's strategy is to satisfy and exploit an increasing need for economical long-haul transportation and disposal of solid waste from large urban centers in the US and Canada where capacity is becoming increasingly limited, to disposal facilities in the Midwest and Southeast where disposal capacity is more abundant and economical. TLA - Bale Tech hired Deaton Engineering, Inc. to design, engineer and produce manufacturing documentation for a portable and robust stretch-wrap baling system. The system needs to be suitable for continuous processing and be portable for standby solutions for unexpected waste management disruptions including: natural disasters, military zones, and economic hardships. The client wants to leverage decades of baling systems and waste management experience to pave the way for the development of portable processing equipment to handle municipal solid waste that is environmentally friendly, operationally efficient, and cost effective. 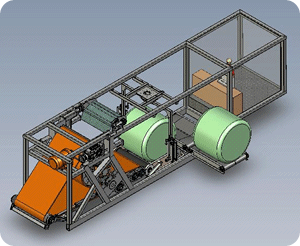 Deaton Engineering, along with TLA - Bale Tech, produced the next generation stretch-wrap portable baling system that innovates the handling and delivery of waste commodities. Bale Tech III is a patented high-speed baling and wrapping system that produces highly compacted cylindrical bales of shredded waste. Bale Tech III bales have a standardized weight of 3 tons, when baling municipal solid waste and do not leak or emit odors, making them ideal for long-term storage and multi-modal transportation. Length 50" - 60" and diameter 66" - 74"